What is a panic attack? How effective is mindfulness for people who suffer from a major depressive disorder? This master takes an evidence-based approach in that the course material covering these three areas is based on findings from (experimental) empirical research. You will learn how to apply scientific findings to clinical practice, and in turn, how experiences in the clinic can be translated to testable research questions. 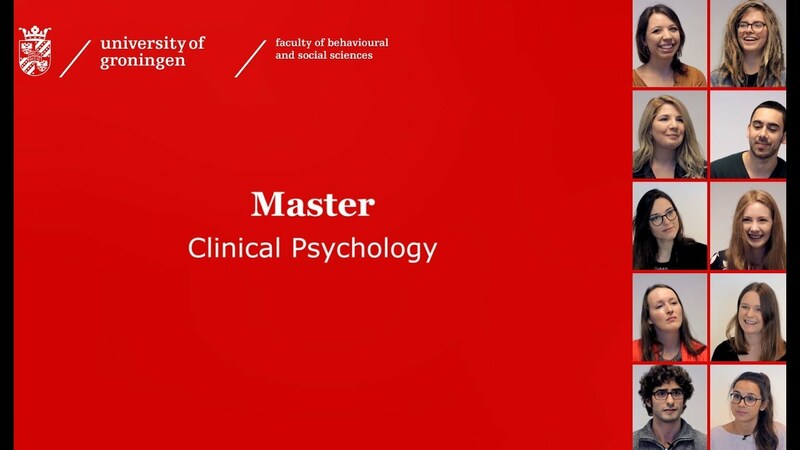 To meet requirements for this mastertrack Clinical Psychology, you will complete 2 basic courses, 1 skills course, 2 electives, 1 method course and a Master's thesis. The Master's thesis has several varieties but always encompasses half of the master (30 EC). You may want to devote your master's thesis in its entirety to research into a clinically relevant problem. For this purpose you may be involved in testing patients. Alternatively, you may engage in testing participants without actual psychopathology. Much of the theorizing in clinical psychology is based on experimental studies that aim at modelling clinically relevant phenomena in the psychological laboratory. to get paid by the statutory health insurance. to be legally allowed to treat patients, but not eligible to get paid by the statutory health insurance. The global mission of the expertise group Experimental Psychotherapy and Psychopathology is to help explain key features of psychopathology that are shared by many of the psychiatric disorders and to translate our findings into clinical applications. There are collaborations with Mental Health Institutions (MHIs) such as the in- and outpatient clinic GGZ-Drenthe (e.g., psychotic disorders section) and the University Centre for Child and Adolescent Psychiatry Accare (e.g., anxiety and mood disorders section, eating disorders section). In addition, researchers in the group participate in large scale longitudinal studies such as the Netherlands Study on Depression & Anxiety (www.nesda.nl) and Tracking Adolescents' Individual Life Survey study (www.trials.nl). My research focusses on the long-term consequences of childhood trauma. I offer Master thesis supervision in this realm. I mostly study patients suffering from Post traumatic Stress Disorder or Dissociative Disorders. To this end, I combine neuro-biological methods such as neuro-imaging (fMRI) with behavioural and self-report methods. Also I am trained in trauma therapy and pass on my clinical knowledge in the practical offered in the Master program [link here pointing to PSMKV-3). One of my research interests therefore is also how therapists cope with listening to their patients' trauma narratives and if they experience 'secondary traumatization'. Courses: Cognitive Models in Psychopathology, Theme Dissociatie; Capita Selecta Experimental Psychopathology: Dissociative disorder and Master thesis research supervision. The main focus in my research is on cognitive and behavioural processes in trauma-related disorders (dissociative disorders and post traumatic stress disorder), with a special emphasis on memory processes. Expertise: trauma and post traumatic stress disorder, anxiety disorders, fear conditioning and cognitive behavioural therapy. Courses: Capita selecta therapy: treatment protocols; Cognitive Models in Psychopathology, Theme Compulsive behaviour, Master thesis research supervision. The combination of my research into anxiety and trauma-related disorders and its treatment, and my background as a cognitive behavioural therapist make a perfect match to teach students about psychopathology, including the experimental and clinical research in this area as well as phenomenology and treatment in clinical practice. My research: ition in psychotic disorders. I am involved in various studies into innovative treatment methods, such as training social cognition with Virtual Reality and increasing the resilience of people with a psychotic disorder by means of kick-boxing. When I finished the Master's programme in Clinical psychology in 2010 I was in my early twenties, and I was not sure whether I wanted to find a job as a psychologist right away. I had done an internship at the Association of Mental Health and Addiction Care in Drenthe (GGZ Drenthe) and I had sometimes felt too young, especially when interacting with older patients. That is why I decided to do a PhD first. I examined the treatment of patients with a depression relapse. I enjoyed doing research, but after the PhD I wanted to work as a real psychologist. I did the postdoctoral GZ training programme to become a healthcare psychologist. When you finish your Master's degree you are a basic psychologist. This means that you may not yet make diagnoses or perform treatments independently. I did the training whilst working at GGZ Drenthe. During the two year training programme I worked four days a week and went to school for one day a week. After the training, I could stay at my job and at the moment I work for the psychosis team of GGZ Drenthe. We mainly work with young people with a first psychosis or at risk of a first psychosis. I do for example intakes, psychological research and cognitive behavioural therapy. It is a very diverse job. Sometimes it is hard, but it is very nice to be able to help these young people. I use a lot of the things I learned during my studies. The research and conversations methods we learned are still useful every day. I think there is not such a big difference between doing research at a university or in a clinic. In both contexts you have a certain hypothesis, about a research field or about a patient, which you have to test. You gather information, it takes a while, and in the end you come to a conclusion. The way of thinking is the same. My advice for current students is to find a nice internship (which can be hard) and to choose the right courses so that you will be accepted for the postdoctoral training. It is quite hard to get into the postdoctoral training programme, soP it might be useful to have a plan B.
I chose this programme because I am really interested in psychotherapy. My name is Magdalena Hristova and I'm from Bulgaria. I came to Groningen five years ago to follow a Bachelor's programme in Psychology. Now I'm following a Master's programme in Clinical Psychology. When I left school in Bulgaria, I knew I wanted to study abroad, in English. I looked at universities in the Netherlands, because I knew I liked the country, and found the Bachelor's programme in Groningen. It was not only the only programme taught in English, but also the most appealing. During my Bachelor's programme I became really interested in psychotherapy. I chose the Master's programme in Clinical Psychology because I wanted to learn more about it. I had learned Dutch during my Bachelor's programme, so was able to follow the Dutch-taught Master's programme – at the time it was not taught in English. It's been hard at times, but my lecturers and fellow students have really helped me. I love the Dutch openness and the freedom to do what you want. In my work as a student assistant at the UMCG, I help train medical students, and this got me interested in working with groups. As I wanted to learn more about this, I started a second Master's programme in Utrecht: Social and Organizational Psychology. In future, I would like to combine both Master's degrees in my work. I like the city of Groningen. Everything is close by, so you can go everywhere by bike. In Bulgaria you always have to take the bus, but the bike is a lot better, for yourself and for the environment. There are a lot of student societies that you can join in Groningen. I joined a student swimming club in my second year, which really improved my Dutch. In my time here I have really challenged myself. Even if I thought something was impossible I still went for it. The Master's programme has been difficult but I haven't given up. This made me realize that I'm capable of more than I think I am. If you think you can't do something, I would say go for it anyway. You'll find help along the way. I did not study abroad during my Bachelor's programme and when I saw a message from this study programme that they were looking for a student who was willing to write his or her Master's thesis in Canada, I immediately responded. This way, I still had the opportunity to go abroad during my studies. I did research on neuroticism with monozygotic twins for half a year there. It was a great experience which I can recommend to anyone. After the Bachelor in Psychology I decided to do the Master’s programme in ‘Clinical Psychology’. At first, I had to get used to the Master’s programme. At the exams we suddenly had mainly open questions instead of the multiple choice questions, which we had during the Bachelor’s programme. We studied the material in greater depth, which was nice. However, everything was still quite theoretical during the Master’s programme. That is why I am glad that I did an internship; I learned a lot from that. I did an internship at Maarsingh & van Steijn, a psychologists practice in Leeuwarden. In the beginning, I watched the work of my colleagues a lot, but after a while I was also allowed to treat people myself. I thought that was very scary but at the same time a lot of fun and incredibly interesting. After graduating, I was able to stay and I would work for several hours a week on my internship. Gradually, I could work more and more hours and now I am even allowed to start the GZ-programme next month. Then I will have one training day a week and three normal working days at the practice. I am now a basic psychologist. I am allowed to do a lot of things, but still officially under the supervision of some colleagues. Usually, I see about five people a day; I talk to all of them for about an hour. I do coaching, assessments, psychological treatments and diagnostics. I also write reports and contact GP’s and employers. Once I am officially qualified as a GZ psychologist I can write my own name under the reports, and I will have more basic knowledge I can rely on. I really like my job. It is very diverse, I treat people with all kinds of problems. I also give group trainings, for example, to people with a negative self-image. At the moment, I only treat people under 35, because otherwise the age difference becomes too big. I see a lot of students, because I am still quite young and it is easier for me to understand them. like (experimental) research are looking for a challenge beyond just “helping people”. Do not hesitate to make an appointment with an academic advisor. You can arrange for a meeting by phone (+31 50 363 6301, student service desk) Please also check our online information system: www.rug.nl/gmw/questionandanswer.